Charleston's colorful streets leading up to a large church. Charleston, South Carolina is a beautiful city filled with history, beautiful streets, delicious southern style food, and much more awesome stuff crammed into a small area. I was only able to be here for a day, but that still allowed me to see how great that it is and how much I need to come back to be able to see more of the area and what it offers. 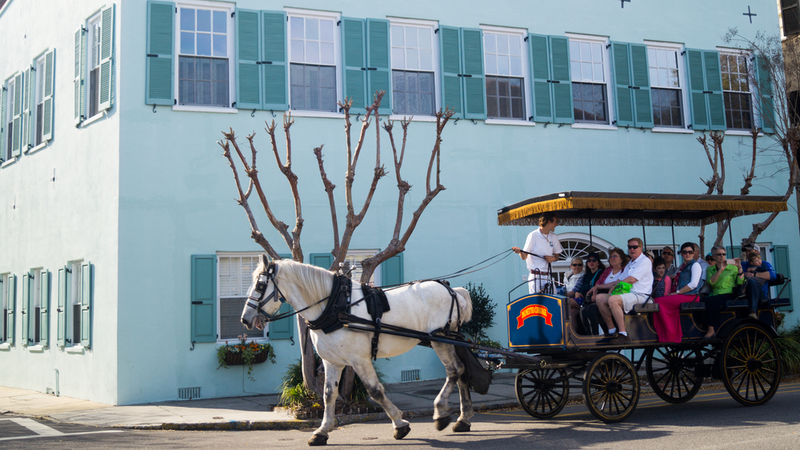 Charleston offers tons of things to do in its little streets. This makes it two things which is that Charleston is not a place to drive around the sites and simultaneously great for anyone willing to explore using their legs. Walking around allows easy access to little shops, enjoying the colors, getting close to the bay, and visiting the historic parks as well. You can also find some beautiful churches and old city cemeteries that are both stunning and interesting to explore. Walking to the southern part of the city you can take the elevated walkway around next to the bay where the Castle Pinckney and Fort Sumter are easily seen. A boat crossing in front of Castle Pinckney during a sunny day. The city’s history goes way back to the Revolutionary War where its most famous Fort Sumter got its name. The Fort is famous for it being where the first shots of the American Civil War were fired. Fort Sumter can be accessed by the public via the ferry which runs as long as the fort is open which isn’t all that late so be prepared to plan ahead if you want to visit their page on the National Park's website. Also, there is Castle Pinckney, which is easily viewable from the southern shore of Charleston’s downtown being the closer of the two walled islands. The other major attraction for the intense military history of Charleston is Patriots Point. This is a museum for the Naval and Marine divisions of the military, which has a large aircraft carrier for visitors to walk on and see. I wish I could have gotten to one of these places or one of the various museums located in downtown Charleston, but I failed to because of timing. Next time, I will be planning on getting to these two things as well as possibly more as Charleston deserves more time spent than just a single day. During your stay in Charleston, you will surely need food as well as a place to stay. I would recommend finding one of the more inexpensive hotels to stay in near the downtown area, but be careful because they may fill up quickly and the alternatives are spending a lot more on a hotel or leaving downtown and going over one of the bridges to a different part of town. I recommend staying close to the downtown because this is where the life of the city really exists with most of the museums, access to Fort Sumter, and walking distance from many great restaurants and places to enjoy the day. There are tons of places to get food in downtown Charleston. Many of the places can be a bit pricey, but if you are conscious of this you can find deals like I did at the Kickin’ Chicken with great food, atmosphere, and all for a reasonable price. A sailboat in Charleston's Bay during a bright and sunny day.